As long as you have a decent MIDI keyboard, iLectric Piano is a blast to jam on, and now that it has Audiobus support, it can serve as a vital part of your iPad studio. Fun. Decent sounds. MIDI recorder. Audio Export. You'll need to buy the extra in-app expansion pack to get full use from the app. iLectric Piano follows a similar formula to earlier IK iPad release iGrand Piano, but with the focus on electric keyboards rather than acoustic ones. 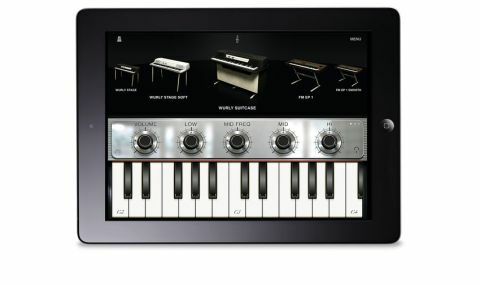 "This reinforces the argument that the iPad is capable of serving as a respectable sound source for keyboard players"
Sample-based Fender Rhodes, Wurlitzer and Clavinet instruments are all present and correct, and they reinforce the argument that the iPad is capable of serving as a very respectable sound source for performing keyboard players. iLectric Piano also provides the likes of FM pianos and electronic grands. There are multiple sonic variations on all of the instruments, the downside being that some of them have to be purchased as a £6.99/$10.00 in-app expansion pack. All the presets are tweakable with the MIDI-assignable knobs, while adjustable effects help to breathe life into the sounds. A MIDI recorder and a variety of audio export options are here, too, as is Audiobus support.